Our featured charity this month is the Worldwide Veterinary Service (WVS). 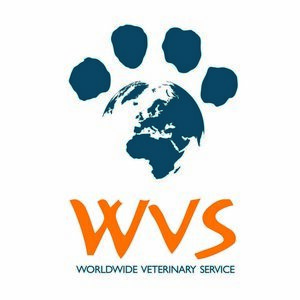 WVS is a UK Charity who focus on supplying veterinary aid to animal welfare charities and non-profit organisations to places across the world, where it isn’t readily available. They provide aid in the form of volunteer teams, veterinary equipment, drugs and advice. Starting in 2002 and registered as a charity in 2003 WVS operates out of a small office in Cranborne. Despite humble beginnings, it has has grown rapidly and is now relied on by over 600 charities, in over 100 different countries. WVS runs a yearly ‘Parcel Appeal’ to fund the veterinary supplies that they send to support the work of animal charities all over the world. Because many of the charies that WVS supports have limited funds and geographical constraints, there is a huge demand for WVS’ services. In 2013 WVS sent out 874 veterinary aid parcels and in the past 5 years the value of veterinary aid that WVS has sent is worth well over £1.3m. The scale of the work that WVS does can bee seen by the fact that last year, over 88,000 animals were treated by their teams. In 2013, WVS sent out an average of more than one volunteer team every week to support the work of animal welfare charities on the ground. WVS volunteers take part in a range of animal welfare projects, from neutering campaigns and mobile health/vaccination clinics to welfare education programmes, wildlife conservation projects and emergency disaster response. In September 2010 Worldwide Veterinary Service (WVS) launched a large scale initiative, the first of its kind. The initative, the WVS International Training Centre (ITC), was based in India and provides practical surgery training to Indian vets in addition to promoting animal birth control within the country. Every year the International Training Centre is responsible for training over 250 vets who go on pass on their newfound knowledge to set up and run their own animal birth control programmes. Helping the WVS is simple, just Like the Oxford Learning College Facebook page and we’ll donate 50p!